Face it, there are times when you goof up an insignia or you are doing a custom scheme and you just need some insignia. 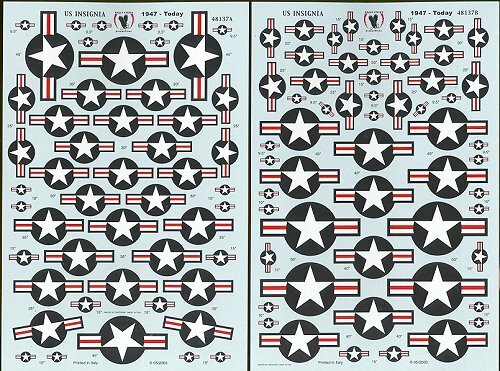 This pair of sheets contains a wide range of insignia from 9.5 to 45 inches, which should be enough for just about any aircraft around. The smaller insignia could well be used on 1/72 kits as well, though I'm sure a 1/72 set is soon to be available if it isn't already. A great idea and one that every modeler should have 'just in case'.